Last week, a large part of the global art world flocked to Moscow before passing through Stockholm (Moderna Museet opening of After Babel) Hydra (opening of Paul Chan Hippias Minor at the Deste Foundation) and then landing in Basel (for Art Basel). 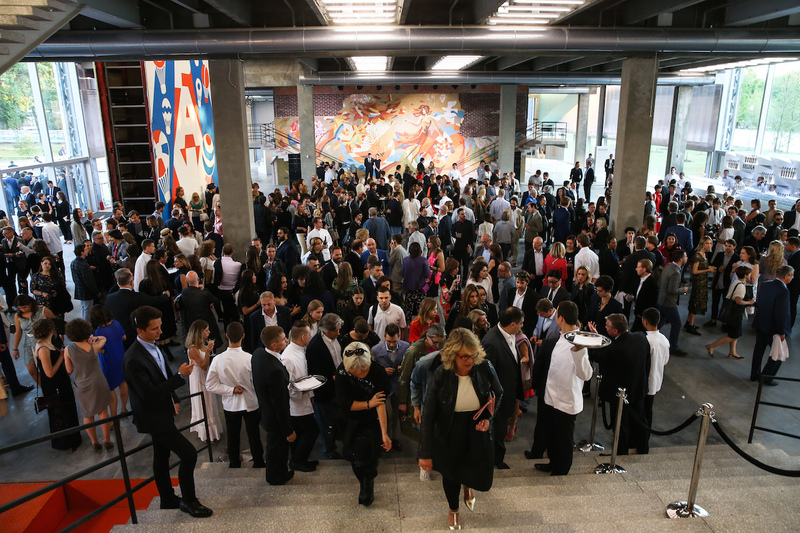 The reason for the stop-over in Moscow was the long awaited opening of the Garage Museum of Contemporary Art in a slick new building designed by architect Rem Koolhaas and OMA Studio. Founded by art world darling Dasha Zhukova and her husband Roman Abramovich, the museum officially opens June 12th, 2015 to the public. In celebration for the opening, several events, talks and various public programs are planned, including opportunities to meet artists. Artists who have work represented in the space for the inaugural event include Yayoi Kusama, Rirkrit Tiravanija, Julius Koller, archive photographs by Russian artist George Kiesewalter, Koyo Kouoh, Rasha Salti, Technical Assistance of the Museum of American Art in Berlin, Taryn Simon, Anton Vidokle and a site-specific installation by Katharina Grosse. Chief Curator Kate Fowle, took part on a panel along with partners Zhukova and Abramovich, Director Anton Belov and Rem Koolhaas introducing the new building to those present. The event welcomed over 500 guests from all over the world, most from the art world with a smattering of Hollywood conosciuti including Star Wars director George Lucas (who took part in Hans Ulrich Obrist’s on-going quote series for instagram) along with Woody Allen and family. 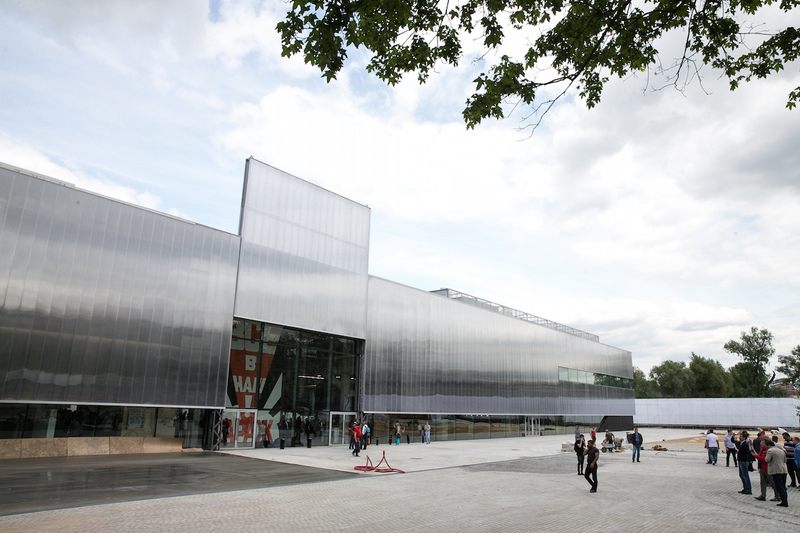 Previously located in the former Bakhmetyevsky bus depot, from 2008 until 2011, the museum relocated to Gorky Park (a more central part of the city) before finding a permanent home in this current iteration, along with an official name change from the Garage Center for Contemporary Culture to the Garage Museum of Contemporary Art. Koolhaas’ structure, used the structure previously built in 1968, the Vremena Goda (Seasons of the Year) Soviet Modernist restaurant, and with inserting his own aesthetic twist, created what is now a contemporary art museum. Opening with a bang and eight exhibitions (! ), artists such as Yayoi Kusama (Infinity Theory on view until August 9th), Rirkrit Tiravanija (Tomorrow is the Question, on view until August 23rd), and a series of exhibitions paying homage to the Russia of a recent past, are sure to be crowd pleasers and will most likely bring art lovers from all over Europe and neighboring countries. Referencing the original work, YOKO ONO MORNING PEACE 2015 is a sunrise gathering activated by events across the globe, allowing the celebration to continue for 24 hours as the sun rises in different time zones. In Moscow, the gathering will commence with the sun at 3:40 a.m. and will include talks, performances, live music and workshops by local artists. If in New York, Morning Peace 2015 will take place starting at 4:30 a.m. with sunrise at 5:25 a.m. on June 21st at the Museum of Modern Art. This global performative gesture invites participants to follow the directions below and will celebrate Yoko Ono: One Woman Show, 1969-1971. 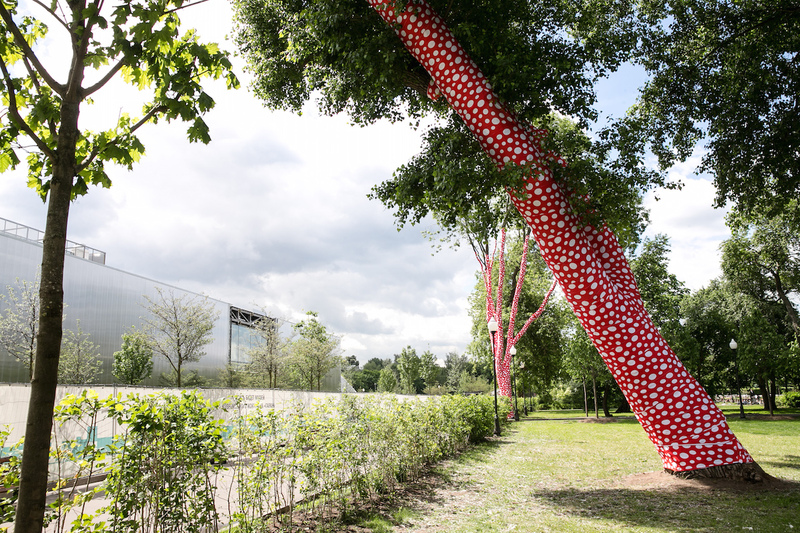 Get ready Moscow, the new and improved Garage is raising the bar on contemporary art.